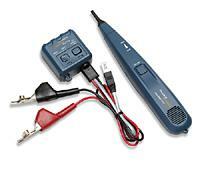 The Pro3000 Tone and Probe Kit is the innovative analog tone and probe from Fluke Networks. Easily identify individual pairs with its patented SmartTone technology (the five different tones for exact pair identification). The large powerful speaker on the probe allows you to hear through drywall, wood or other enclosures to find wires quickly and easily. Kit includes pouch.